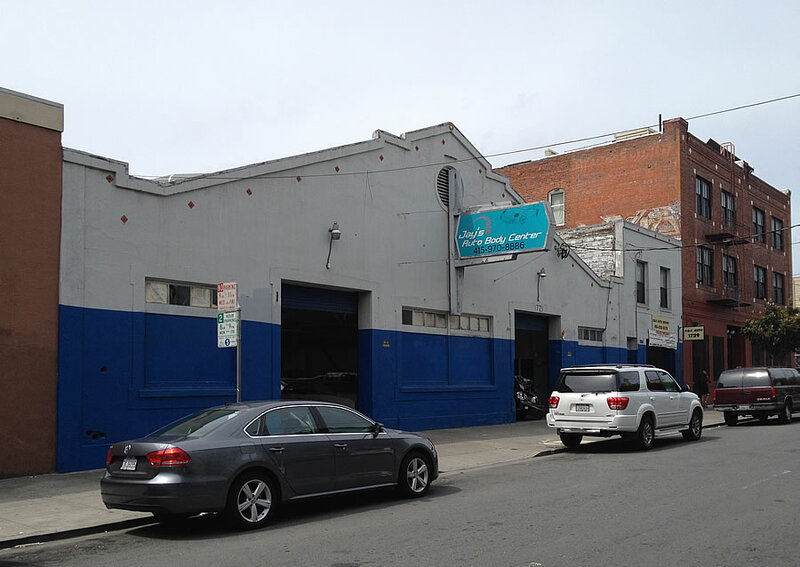 Considered a potential Historic Resource for the ‘Inner Mission Reconstruction Historic District,’ the redevelopment of the garage known as Jay’s Auto Body Center at 1721 15th Street, between Little Star Pizza and The Monastery, could be a little tricky. But the owners of the building have met with San Francisco’s Planning Department to explore the possibility of ‘converting’ the garage into a 27-unit condo project. And the building is about to hit the market listed as a ‘development opportunity’ by the Urban Group. After the Inner Mission North was destroyed by the earthquake and fires of April 1906, the reconstruction of the neighborhood involved three phases. The initial “relief” phase, which ended in 1908, was characterized by small ad hoc cottages and shacks that provided immediate, temporary shelter for the desperate refugee population, and by hastily erected shops and stands that were critical in providing for the flows of common goods and services, as well as cash, that helped to sustain the area’s refugee population. The second phase of “rebuilding” involved the construction of permanent replacement structures, which in some instances began immediately after the 1906 fires, and in other instances continued well into the 1910s. During the final phase of post-fire “recovery” that extended into the 1920s, the permanent resettlement of uprooted populations in rebuilt neighborhoods such as the Inner Mission North was finally achieved. Within the historic district, which is part of the most urbanized area of the Inner Mission North, only a very few small, plain buildings remain intact from the early “relief” era. Most of the extant buildings represent the permanent “rebuilding” period, during which substantial multiple-story structures were erected to replace either destroyed buildings and/or the earliest temporary structures. The garage at 1721 15th Street was built in 1916, on a site which is now zoned for development up to 55 feet in height. Still don’t understand why this is historic… the ‘contribution’ tag they slap on buildings in historic districts is also insane. I guess it’s historic mearly because it’s old. And I suppose you’re expert who should assess the significance, from your chair at work, based on a couple paragraphs and one image…. the experts who did the evaluation probably didn’t do any research or thinking, just slapped the “tag” on it and walked away…. is that you’re thinking? Please tell us more Giuliani. I’m interested in utility structures and if this building is special it would be good to know why it stands out from others like it. The problem is these “expert” determinations are in themselves somewhat arbitrary. There is an implicit assumption in the field of preservation that old buildings are generally automatically worth preserving, and the criteria are crafted to support such determinations. This is not an issue of an expert structural engineer determining if a building is safe or meets a current technical code. Instead, there is a value judgment that “preserving” a certain period of history is worth more than, for instance, building more housing or developing a more attractive streetscape. For what it’s worth, I like old industrial buildings. (The blue color is terrible, though) Does that mean, though, that the police power of the State, the heavy hand of the Law, should be used to permanently freeze the building in place? Kind of ironic that Giuliani slammed ElitistPig’s opinion with just another vague opinion. There are objective ways to evaluate a building’s historical significance and that was what I was hoping to get from my question to Giuliani. We should be thankful that industrial and utility structures are now even candidates to be considered as historic. Not that long ago they were thought of as unwanted eyesores to be destroyed even if that meant leaving a vacant lot. I’m skeptical about the significance of this particular garage but am still open to knowing more if anyone has the deets. if this one gets greenlighted it should not be awarded any parking whatsoever. 15th st is already a mess right there daily. two blocks to BART? no parking for you. The usual reason the traffic is a mess there is because of the cars moving in and out of the auto repair garage being double parked. I don’t think normal car traffic moving out of an on-site parking lot would cause the same trouble as they can simply pull out when the light changes on this one way street. your wrong as always, and clearly don’t have a lot of experience in cities. I don’t get it either. 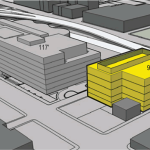 Pier 70’s historic core – yes, but not this. So we justify tearing down the old brick roundhouse in San Jose, the explosives factory in Hercules, old canneries, and similar structures outside of SF: all structures that are unique to the Bay Area and have local historical significance. But a generic garage structure that is replicated all over California? That’s worth saving? This isn’t about historic preservation. It is like applying CEQA to block a project on a technicality. There’s an ulterior motive here. Preservation is arbitrary and capricious. There was a crappy little abandoned garage from the 1930s in the heart of uber-expensiver St. Helena. Not been used for years. But in Preservationese it was a “contributing building”. The replacement structure is not ground breaking in any way, but it is much more urban and completes the street wall. I am suspicious of purist preservationism, even if I understand the inherent desire to freeze change and even the need to preserve older, cheaper space. So…this is the conflict. yes ok fine it might have some marginal ‘historic’ value. But SF does not need to become a “noah’s ark” of every architectural style and period of construction that has ever occurred. Saving a few examples are worthy but this seems a bit excessive (compulsive?). But it has a round ventilation opening!!! Its embarrassing what SF considers historic.Go travel Europe if you want actual history. Or, even Denver, Portland and Seattle. Late 19th century American commercial architecture could be quite remarkable. It’s painful to contemplate all that was lost in 1906. What we consider “ugly” changes…. I consider this much more beautiful than what SF is building today. The 70’s architecture that many people criticize today was considered good when it was built….. Ugly / Beautiful is a completely subjective criteria… so yes we need to rely on other criteria…. take a third thought. I actually agree with you that beautiful is subjective. But valuing “history” over property owner rights is not that third thought, necessarily, except for significant examples. Europe doesn’t look like it has history due to tearing things down, you know. Much of the historic fabric we ooh and ahh about does not consist of hastily erected 1916 garages painted with dark blue stripes. Honestly looks like crap. If they want it preserved so badly, keep the facia of the building and “remodel” it. Where is David Campos on this? Would the proposed moratorium affect this project? Can we ensure that future users of the site continue to paint over the windows? It would be more authentic to save and repurpose the panes. I like the building and I hope they have to keep it. Then buy it yourself and donate it to the MISSION DISTRICT ANTI GENTRIFICATION COALITION for conversion to a unregulated “wet” homeless shelter! More than one goal met! I’m all for historic preservation, more than the average person. But, really? There are buildings on Van Ness and adjacent that have much more character. I’m still shocked they tore down the old Dawydiak dealership on Franklin and Bush. That building had a lot of detail and character. Agree it was (?) A great building but I do think that it is being retained as the facade of the lower level of the residential building above much as they are doing just uphill on Pine. Is it? They must have carted the facade away during construction only to return once it is done. And Preservationists wonder why they don’t get no respect. I think those red diamonds might be rusty anchors for bolts going through the facade and holding up/down the roof??? Heh. How many will miss this ugly utilitarian building if it is razed ?? Is this part of the cultural heritage of the Mission? Its all like Christmas with a dysfunctional family. Add a merry go round. Why not designate buildings like this as candidates for a “creative reformatting?” i.e. someone with resources and energy can buy and repurpose them, rather than just convert them into ugly condos or worse still, leave them dormant in a fantasy PDR past that barely ever existed. You can write the downpayment. I will volunteer to be your squatting tenant and I promise to offer neighborhood and cultural appropriate arts events! Contact me! I appreciate the irony of how it’s technically historic and worth saving specifically because it was a slapped-together building just put up as an emergency measure. In another context, being a purely utilitarian building by an anonymous architect (or perhaps no architect at all) would mean the opposite—that a building was non-notable in every way. Still, I think if someone wants to preserve a garage so much it should be on them to purchase it. Start a kickstarter. Don’t saddle the poor building owner with the baggage of permanent, in-amber preservation with dubious public appeal. No one’s going to convert this into the, “Mission Post-Earthquake Relief Era One-Story Commercial Building Museum & Gift Shop” anytime soon…or ever. And due to its age, eventually this building will be useless as anything but an artifact which no one cares about or is willing to spend money on. It will have to be be permanently abandoned.